France said it would deploy its only aircraft carrier – the Charles de Gaulle – to boost its military operations against Islamic State (IS, formerly ISIS/ISIL). “The deployment of the battle group alongside the Charles de Gaulle aircraft carrier has been decided to participate in operations against Daesch [ISIS] and its affiliate groups” the French president’s office said in a statement issued on Thursday after a defense cabinet meeting, Reuters reports. President Hollande also said France wants to support the Vienna process and to make progress towards a political transition in Syria, the statement says. He added that fighting Islamic State and putting an end to the bombing of civilians must be core elements in any future accord, noting that president Assad cannot be part of the Syria’s future. France launched its anti-IS airstrikes in Syria in September after a year of similar operation in Iraq. It used six Rafale jets deployed in the United Arab Emirates and six Mirages stationed in Jordan, according to AFP. France conducted almost 1,300 aerial missions in Iraq which carried out 271 airstrikes destroying 459 targets. France has only carried out two airstrikes in Syria. 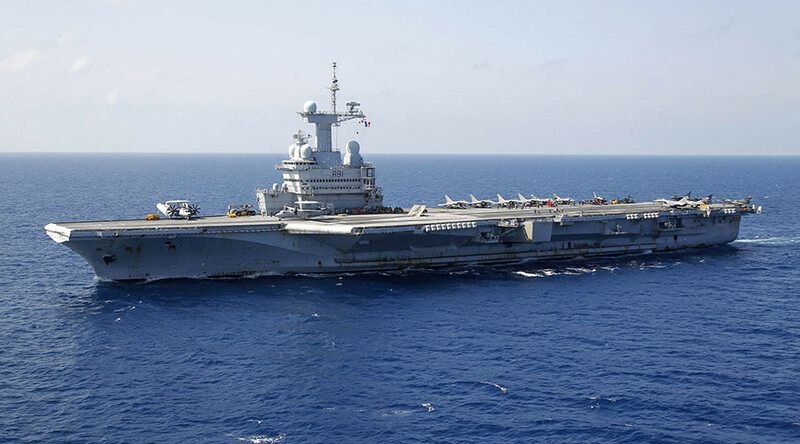 France’s only aircraft carrier, the Charles de Gaulle, is the biggest European ship of its type. Moreover, it is the only nuclear-powered aircraft carrier outside the US. The Charles de Gaulle can deploy up to 40 fixed wing aircraft and helicopters.